Look up ch in Wiktionary, the free dictionary. Ch is a digraph in the Latin script. It is treated as a letter of its own in Chamorro, Old Spanish, Czech, Slovak, Igbo, Kazakh, Uzbek, Quechua, Guarani, Welsh, Cornish, Breton and Belarusian Łacinka alphabets. In Vietnamese and Modern Spanish, it also used to be considered a letter for collation purposes but this is no longer common. The digraph was first used in Latin since the 2nd century B.C. to transliterate the sound of the Greek letter chi in words borrowed from that language. In classical times, Greeks pronounced this as an aspirated voiceless velar plosive [kʰ]. In post-classical Greek (Koine and Modern) this sound developed into a fricative [x]. Since neither sound was found in native Latin words (with some exceptions like pulcher 'beautiful', where the original sound [k] was influenced by [l] or [r]), in Late Latin the pronunciation [k] occurred. In Old French, a language that had no [kʰ] or [x] and represented [k] by c, k or qu, ch began to be used to represent the voiceless palatal plosive [c], which came from [k] in some positions and later became [tʃ] and then [ʃ]. Now the digraph ch is used for all the aforementioned sounds, as shown below. The Old French usage of ch was also a model of several other digraphs for palatals or postalveolars: lh (digraph), nh (digraph), sh (digraph). In the Goidelic languages, several Germanic, and Slavic languages that use the Latin alphabet instead of the Cyrillic alphabet, and others, ch represents the voiceless velar fricative [x]. Additionally, "ch" is frequently used in transliterating into many European languages from Greek, Hebrew, Yiddish and various others. 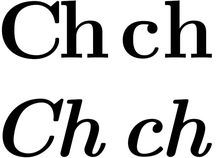 Breton has evolved a modified form of this digraph, c'h for representing [x], as opposed to ch, which stands for [ʃ]. In Manx, "ch" stands for [x], while [tʃ] is represented by çh. In Rheinische Dokumenta, ch represents [x], as opposed to ch, which stands for [ç]. In Welsh, it represents the voiceless uvular fricative [χ]. In English, ch is most commonly pronounced as [tʃ], as in chalk, cheese, cherry, church, much, etc. Ch can also be pronounced as [k], as in ache, choir, school and stomach. Most words with this pronunciation of ch find their origin in Greek words with the letter chi, like mechanics, chemistry and character. In English words of French origin, "ch" represents [ʃ], as in charade, machine, and nonchalant. This pronunciation also occurs in a few loan words from other sources, like machete (from Spanish) and pistachio (from Italian). In certain dialects of British English ch is often pronounced [dʒ] in two words: sandwich and spinach, and also in place names, such as Greenwich and Norwich. In words of Scots origin it may be pronounced as [x] (or [k]), as in loch and clachan. In words of Hebrew or Yiddish origin it may be pronounced as [χ] (or [x]), as in challah. The digraph can also be silent, as in Crichton, currach, drachm, yacht and traditionally in schism. In Breton ch represents the [ʃ]. This digraph should not be confused with c'h [x]. In Catalan ch represents final [k] sound. In the past it was widely used, but nowadays it is only used in some surnames. In medieval Catalan it was occasionally used to represent [tʃ] sound. Ch is the fifth letter of the Chamorro language and its sound is [ts]. In Mandarin Chinese ch is used in Pinyin to represent an aspirated voiceless retroflex affricate /tʂʰ/. The letter ch is a digraph consisting of the sequence of Latin alphabet graphemes C and H, however it is a single phoneme (pronounced as a voiceless velar fricative [x]) and represents a single entity in Czech collation order, inserted between H and I. In capitalized form, Ch is used at the beginning of a sentence (Chechtal se. "He giggled. "), while CH or Ch can be used for standalone letter in lists etc. and only fully capitalized CH is used when the letter is a part of an abbreviation (e.g. CHKO Beskydy) and in all-uppercase texts. In Czech alphabet, the digraph Ch is handled as a letter equal to other letters. In Czech dictionaries, indexes, and other alphabetical lists, it has its own section, following that of words (including names) beginning with H and preceding that of words that begin with I. Thus, the word chemie will not be found in the C section of a Czech dictionary, nor the name Chalupa in the C section of the phonebook. The alphabetical order h ch is observed also when the combination ch occurs in median or final position: Praha precedes Prachatice, hod precedes hoch. In the 15th century, the Czech language used to contain many digraphs like modern Polish does but most of them were replaced by single letters with diacritic marks by the reform of Jan Hus. Besides ch, there is only one digraph used in the Czech language - dž, representing voiced postalveolar affricate. However, ch is the only Czech digraph which is treated as a single letter while dž is used in translating a foreign word into Czech (to approximate a foreign phonetic sound that has no Czech counterpart e.g. jam in Czech is džem). Dutch ch was originally voiceless, while g was voiced. In the northern Netherlands, both ch and g are voiceless, while in the southern Netherlands and Flanders the voiceless/voiced distinction is upheld. The voiceless fricative is pronounced [x] or [χ] in the north and [ç] in the south, while the voiced fricative is pronounced [ɣ] in the north (i.e. the northern parts of the area that still has this distinction) and [ʝ] in the south. This difference of pronunciation is called 'hard and soft g'. In native French words, ch represents [ʃ] as in chanson (song). In most words of Greek origin, it represents [k] as in archéologie, chœur, chirographier; but chimie, chirurgie, and chimère have [ʃ]. In German, ch represents two allophones: the voiceless velar fricative [x] when following back vowels or [a] (the so-called "Ach-Laut") and the voiceless palatal fricative [ç] in all other positions (the so-called "Ich-Laut"). A similar allophonic variation is assumed to have existed in Old English. In German, it represents [k] before -s, as in Fuchs (fox). An initial Ch (which only appears in loanwords) may also be pronounced [k] in southern varieties, and is always pronounced [k] when a consonant follows the initial Ch as in Christus or Chlor (chlorine). The Rheinische Dokumenta writing system uses ch, for the voiceless palatal fricative [ç], while ch represents [x]. The digraph ch is not properly speaking part of the Hungarian alphabet, but it has historically been used for [tʃ], as in English and Spanish (as with Szechenyi family name), and is found in a few words of Greek or other foreign origin, such as technik, where it is pronounced the same as h, somewhat as in Polish. In Interlingua, ch before e and i represents the sound [k]. In Irish, ch stands for /x/ when broad and /ç/ (or /h/ between vowels) when slender. Examples: broad in chara /ˈxaɾˠə/ "friend" (lenited), loch /ɫ̪ɔx/ "lake, lough", boichte /bˠɔxtʲə/ "poorer"; slender in Chéadaoin /ˈçeːd̪ˠiːnʲ/ "Wednesday" (lenited), deich /dʲɛç/ "ten". In Italian, ch represents the voiceless velar plosive [k] before -e and -i.
Ch represents [t͡ɕ] in the Kazakh Latin alphabet. It is considered a separate letter, and is the 32nd and last letter of the alphabet. As part of the switch of Kazakh from Cyrillic to Latin, the initial proposed Latin alphabet in 2017 (implemented by Presidential Decree 569 of 26 October 2017) tried to avoid the use of accent marks and digraphs in representing certain phonemes. Initially, /t͡ɕ/ would have been represented by ⟨C'⟩. This was revised by Presidential Decree 637 of 19 February 2018, replacing the apostrophe with the diagraph ⟨Ch⟩. The Romans used ch to transliterate the sound of the Greek letter chi in words borrowed from that language. In classical times, Greeks pronounced this as an aspirated voiceless velar plosive [kʰ]. In post-classical Greek (Koine and Modern) this sound developed into a fricative. Ch is used in the Lithuanian language to represent the "soft h" /x/, in word choras [ˈxɔrɐs̪] "choir". This digraph is not considered a single letter in the Lithuanian alphabet. This digraph is used only in loanwords. Ch was used in the Massachusett orthography developed by John Eliot to represent a sound similar to /tʃ/ and in the modern orthography in use by some Wampanoag tribes for the same sound. In both systems, the digraph ch is considered a single letter. In Xhosa and Zulu, ch represents the voiceless aspirated velar dental click [kǀʰ]. In Occitan, ch represents [tʃ], but in some dialects it is [ts]. In the Ossetic Latin alphabet, ch was used to write the sound [tsʰ]. In Palauan, ch represents a glottal stop [ʔ]. Ch has been used in the Polish language to represent the "soft h" /x/ as it is pronounced in the Polish word chleb "bread", and the h to represent "hard h", /ɦ/ where it is distinct, as it is pronounced in the Polish word hak "hook". Between World War I and World War II, the Polish intelligentsia used to exaggerate the "hardness" of the hard Polish h to aid themselves in proper spelling. In most present-day Polish dialects, however, ch and h are uniformly collapsed as /x/. In Portuguese, ch represents [ʃ]. ch is pronounced as a voiceless postalveolar affricate [tʃ] in both Castillian and Hispanic American, or a voiceless postalveolar fricative [ʃ] in Andalusian and Northwestern Mexico. ch has its own name (che) and used to be treated as a distinct letter of the alphabet. While Ch is used at the beginning of a sentence, either Ch or CH may be used for a standalone letter in lists, etc. In a normal Spanish crossword, 'CH' takes up two squares, although in some old crosswords it occupied only one square. Since the 2010 Orthography of the Spanish Language, Ch is no longer considered a letter of its own but rather a diagraph consisting of two letters. Until 1994 ch was also treated as a single letter in Spanish collation order, inserted between C and D; in this way, mancha was after manco and before manda. There was similar special treatment for ll. However, an April 1994 vote in the 10th Congress of the Association of Spanish Language Academies adopted the standard international collation rules, so ch is now considered a sequence of two distinct characters, and dictionaries now place words starting with ch- between those starting with cg- and ci-. Similarly, mancha now precedes manco in alphabetical order. "Ch" was finally dropped as a distinct letter, with the release of the 2010 Orthography of the Spanish Language. In Slovak, ch represents /x/, and more specifically [ɣ] in voiced position. At the beginning of a sentence it is used in two different variants: CH or Ch. It can be followed by a consonant (chladný "cold"), a vowel (chémia "chemistry") or diphthong (chiazmus "chiasmus"). Only few Slovak words treat CH as two separate letters, e.g., viachlasný (e.g. "multivocal" performance), from viac ("multi") and hlas ("voice"). In the Slovak alphabet, it comes between H and I. In Swedish, ch represents /ɧ/ and /ɕ/ in loanwords such as choklad and check. These sounds come from former [ʃ] and [tʃ], respectively. In the conjunction och (and), ch is pronounced [k] or silent. "Ch" represents [kʰ] in Upper Sorbian. Ch represents [tʃ] in Uyghur Latin script. Ch represents [tʃ] in the Uzbek alphabet. It is considered a separate letter, and is the 28th letter of the alphabet. In Vietnamese, ch represents the voiceless palatal plosive [c] in the initial position. In the final position, the pronunciation is identical to the final -k: [k]. In Welsh ch represents the voiceless uvular fricative [χ]. The digraph counts as a separate letter in the Welsh alphabet, positioned after c and before d; so, for example, chwilen 'beetle' comes after cymryd 'take' in Welsh dictionaries; similarly, Tachwedd 'November' comes after taclus 'tidy'. International Morse code provides a unitary code for Ch used in several non-English languages, namely — — — —. In the Czech extension to Braille the letter Ch is represented as the dot pattern ⠻. English literary braille also has a single cell dedicated to ⟨ch⟩ (dots 1–6), which stands for "child" in isolation, but this is considered a single-cell contraction rather than a separate letter. In computing, Ch is represented as a sequence of C and H, not as a single character; only the historical KOI-8 ČS2 encoding contained Ch as a single character. All principal characters created by Roberto Gómez Bolaños for his TV shows have names starting with Ch, including Chómpiras, Dr. Chapatín, and perhaps most famously El Chavo and El Chapulín Colorado, a superhero whose costume has a "CH" inscribed by a heart (analogous to the way Superman's costume has an S inscribed on a diamond). Bolaños' artistic name was Chespirito, also with a Ch (Chespir would be a Spanish substandard pronunciation of Shakespeare; suffix -ito means "little"). ^ "О переводе алфавита казахского языка с кириллицы на латинскую графику" [On the change of the alphabet of the Kazakh language from the Cyrillic to the Latin script] (in Russian). President of the Republic of Kazakhstan. October 26, 2017. Archived from the original on October 27, 2017. Retrieved October 26, 2017. ^ "Kazakhstan adopts new version of Latin-based Kazakh alphabet". The Astana Times. 26 February 2018. ^ "Principales novedades de la última edición de la Ortografía de la lengua española (2010)" (PDF). Real Academia Española. This page was last edited on 8 February 2019, at 15:34 (UTC).